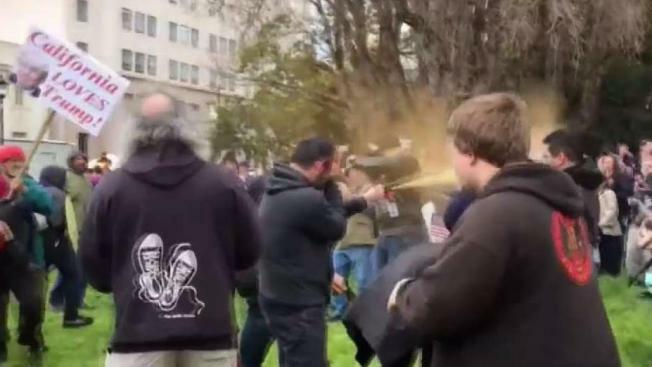 An Alameda County Superior Court jury on Monday found five protesters not guilty of misdemeanor assault charges that were based on allegations that they attacked a President Trump supporter at a rally in Berkeley last year. Prosecutors alleged that Taylor Fuller, Scott Hedrick, Nathan Perry, Jeff Armstrong and Dustin Sawtelle beat Daniel Quillinan at the March4Trump rally at the Martin Luther King Jr. Civic Center Rally in Berkeley on March 4, 2017, during the first of several clashes between pro- and anti-Trump protesters in Berkeley last year. Berkeley police Sgt. Jesse Grant wrote in a probable cause statement that Quillinan was seated at Milvia and Kittredge streets being treated for a three-inch laceration that required stitches when the five counter-protesters kicked and punched him numerous times. In addition to the misdemeanor assault charge, Perry was also charged with a misdemeanor count of possession of a leaded cane or billyclub. However, jurors on Monday found the defendants, who don't live in Berkeley, not guilty of all charges. Armstrong, 33, lives in Oakland, Perry, 35, lives in Modesto, Hedrick, 31, lives in Martinez, and Fuller, 34, and Sawtelle, 40, live in San Francisco. The activist group By Any Means Necessary, or BAMN, describes the defendants as "the Berkeley 5 anti-fascist protesters." BAMN said the five men "are local heroes who stood up to neo-fascist attacks" and alleged that "they are falsely charged by neo-fascists and local law enforcement to advance Trump's agenda in the direction of a police state." BAMN described Quillinan as "a self-proclaimed fascist sympathizer and one of the main organizers of the repeated alt-right protests in Berkeley in 2017."